As we all know, brain nerve connected to the terminal nerve of all parts of the body, so when the baby move in the water, his various actions directly affected and controlled by the nervous system, while the activities of his muscle and each joint in turn stimulate his cerebral cortex nerve, thereby promoting the rapid development of brain function, and make brain’s response to the actions more agile. rapid transmission of comprehensive information of baby’s kinesthesia, gestation, auditory sense, tactile sense, sense of equilibrium, so as to improve reaction speed and promote the synergies of various organs to perform various actions. Baby’s body keep moving and shocking with the waves, which makes baby have physically and mentally comfort and relax, and the insulin levels were significantly increased, thus increasing gastrointestinal peristalsis, help digestion and absorption of food, which increases baby’s appetite, and more fully nutrients absorption. In addition, swimming will consume a certain amount of physical strength, hence baby can sleep better after swimming, and establish a regular sleep. Baby can do big moves like sliding arms, flexing legs and twisting waist easily in the water due to the buoyancy of water, which can make the nutrients and oxygen in blood transfer more quickly to baby’s bone and muscle tissue, and promote the growth of their hormone levels, so that the baby grow faster. When baby doing general movement involuntarily, their arms automatically paddle the water, like chest movement, which can make baby to have deep breath, increasing lung capacity, promoting their blood circulation, accelerating their metabolism, increasing myocardial contractility rate, so as to keep physical fitness and improve immunity effect. 1. Swimming should wait until baby’s umbilical cord fully grown. Newborn baby should learn swimming after 8 weeks in case any infection caused. Umbilical waterproof stickers are designed for baby’s shower, so far, not suitable umbilical cord waterproof stickers found for baby’s swimming. 2. Not all babies are suitable for swimming. 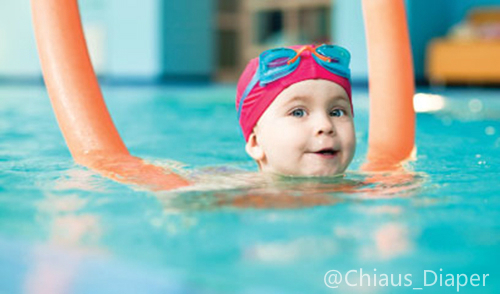 Babies with heart disease, measles, diarrhea, ear infections, asthma, colds and other diseases are not suitable to swim. It should wait at least 48 hours after all these symptoms are eliminated, then parents can take the baby to swim. 3. 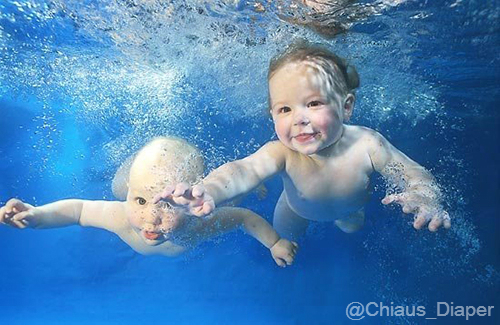 Parents should try to avoid to take babies to swim in their regular breaks. And during baby’s swimming, it’s better that parents can participate in too, parent-child swim not only can train baby’s social skill, strengthen relationship but also can ensure baby’s safety maximally. 4. 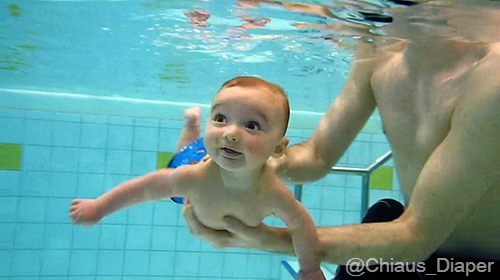 Swimming with collar around neck is very likely to affect the baby's spinal nervous system. Because baby’s cervical are not fully developed, it will bring bad influence if the weight of the whole body are pressed at the top of baby’s body. Such kind of bad influence will become more serious as the increase of baby’s weight. 5. 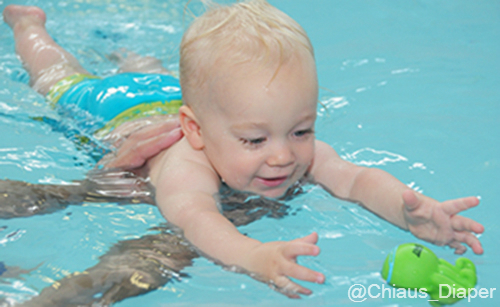 Swimming with collar around oxter will limit the movement of baby’s upper limbs. 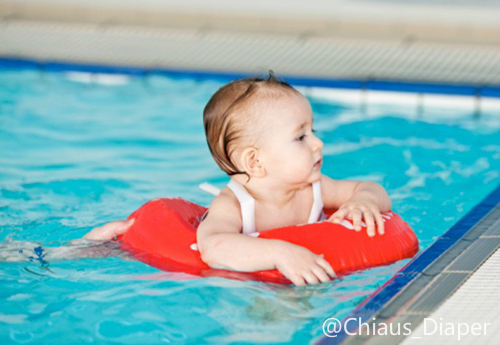 Parents can try to swim together with the baby without swimming ring in professional baby swim pool. More suggestions or tips, welcome to discuss with we Chiaus baby diaper manufacturers. Professional in newborn diapers for baby, adult diaper, pull up training pants.